Search Mineral’s phase III drilling… | Search Minerals Inc.
VANCOUVER, Feb. 1, 2012 /CNW/ - Search Minerals Inc. (“Search” or the “Company”) (TSXV: SMY) and its wholly-owned subsidiary, Alterra Resources Inc., announce positive results from the third phase of drilling at its Foxtrot Project (100% owned) in the Port Hope Simpson REE District, SE Labrador. A 10,000m-drill program is being conducted on the Foxtrot rare earth element (“REE”)-Zr-Y-Nb Project. Assay results for part of this diamond drill program have been received and interpreted. The first phase drill program at the Foxtrot Project consisting of 23 holes drilled in late 2010 and early 2011 (refer to news release, Nov. 2, 2010), intersected REE-Zr-Y-Nb mineralization at depths of 50 and 100m along a 2km strike length. Mineralization consists of fergusonite, allanite and zircon in metamorphosed fine-grained felsic volcanic rocks. The second phase drill program consisted of 20 holes and was drilled in the early summer of 2011. This drill program intersected mineralization at depths of 50, 100, 150, and 200m along a 500m-strike length (refer to news release Aug. 30, 2011). The assays of the highest-grade intersections are markedly consistent throughout both Phase I and Phase II holes. 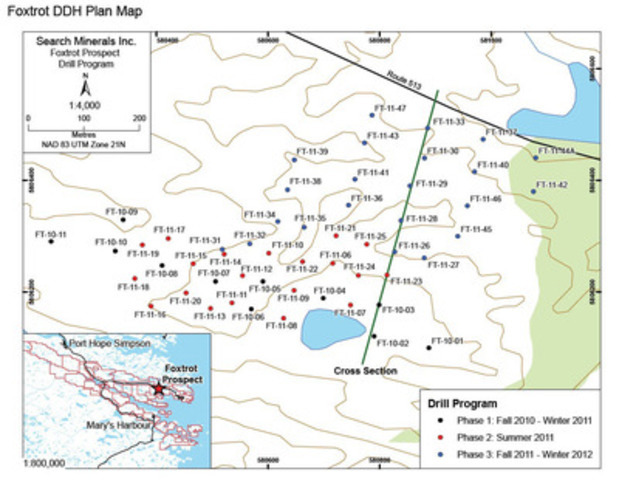 The third phase drill program (approximately 10,000m) is currently in progress (see attached DDH Plan Map), with an expected completion in early February, is designed to intersect mineralization at depths of 150, 200, 250, 300, 350, 400m, and 500m along a 500m-strike length. This news release consists of preliminary results from a single north-south section intersecting mineralization from the 50m to the 400m level (link to cross section), in which five of the holes were drilled during the third phase drill program (from 200m-400m). Weighted averages from the best interval (DDH FT-11-28 from 304.70-321.27m) assayed 247ppm Dy (283ppm Dy2O3), 1309ppm Y, 12855ppm Zr, 0.96% TREE, 1.09% TREE+Y over 14.36m (true thickness). Please refer to the attached table for results. Analytical techniques and sample preparation procedures are outlined in Search’s July 27, 2010 press release. A resource estimate was released for the Foxtrot Project (refer to news release Dec. 20, 2011), which included drilling from Phase I, and II, extending to a depth of 200m. Filing of the supporting NI 43-101 Technical Report is imminent. A revised resource estimate will be produced following completion and interpretation of the results from the Phase III drilling program. This updated resource estimate will extend to a depth of 400m. Jim Clucas, President and CEO of Search Minerals remarks “The discovery of REE-Zr-Y-Nb mineralization to the 400m level at Foxtrot will significantly increase the recently announced resource estimate. We plan to carry out a 40,000m drill program at 25m spacings to produce a measured resource”. The Company’s Port Hope Simpson REE District is 135 km long and 4 - 12 km wide, consists of 4326 claims in 86 licenses, and occupies 1081 square kilometres. There is a total of 9 REE prospects in the District, including: Rock Rolling Hill, Rattling Bog Hill, Piperstock Hill, Southern Shore, Toots Cove, Pesky Hill, HighREE Island, Foxtrot and Ocean View. The Foxtrot Project occurs in the Fox Harbour mineralized belt. Piperstock Hill, Southern Shore, Toots Cove and Pesky Hill occur in a 13 km mineralized zone known as the HighREE Hills. The Ocean View Prospect occurs in a 3 km mineralized zone known as the Ocean View mineralized belt. The Fox Harbour, Ocean View and HighREE Hills mineralized zones are considered very prospective for both HREEs and LREEs.